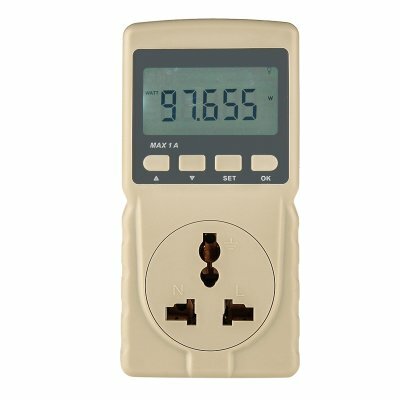 Successfully Added EU Type Socket Universal Adapter + Power Monitor - LCD Display, Watts, Amps, Voltage Readings, CO2 Emissions to your Shopping Cart. Compatible with EU type sockets this universal plug adapter is able to track an monitor all the power running through it and consumed by your household appliances. All that data is shown on the LCD display in wonderful detail down to the hundredth of a Watt. It will also calculate CO2 emission volume and keep track of how much power you have used of a set time. Therefore if you plan to switch to greener fuel or even just want to check how much power that old washing machine uses this is the tool for you. Determine the power consumption of different household appliances and work out how you can save money on your electric bill or better yet, how many solar panels and wind turbines you will need to live off the grid. Great for home use, energy advisors and planning for a greener future, this universal socket will let you plug in most appliances and give you a highly accurate reading of just how efficient they are. This EU Socket Power Monitor and Universal Adapter comes with a 12 months warranty. Brought to you by the leader in electronic devices as well as wholesale power adapters, Chinavasion..